The emerging market equities dump has been underway for months and is only the latest indicator of building economic anxieties – which had to be in the background of President Obama’s talks during his Asia trip, especially with Chinese leaders, including Xi Jinping in The Great Hall. Recent IMF and World Bank meetings showed finance ministers and heads of state focusing on emerging markets as proof of the stalled or anemic recovery, especially in China. This is a topic equally of interest in the U.S. and China, which Obama could address. He might even invite the country's views on the topic of population aging as his administration plans for the White House Conference on Aging in 2015. 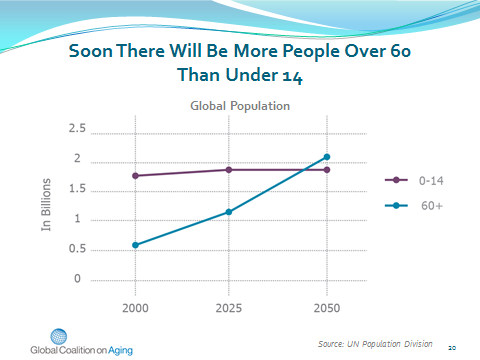 One of this century’s most profound megatrends, the aging of the global population – in which we’ll have more older people than young people (the first chart below) – is the most dramatic in China (the second chart). Its trajectory by 2020 will become both more pronounced than any nation’s on the planet and outpaces the global average. 1: Examine the retirement age. The Chinese only have to look toward their Pacific neighbor, Australia, among the most progressive countries and also among the oldest. Australia plans to incrementally increase its official retirement age to 70 by 2035. That would give it the oldest retirement age on the planet, though many other countries will also start adapting. 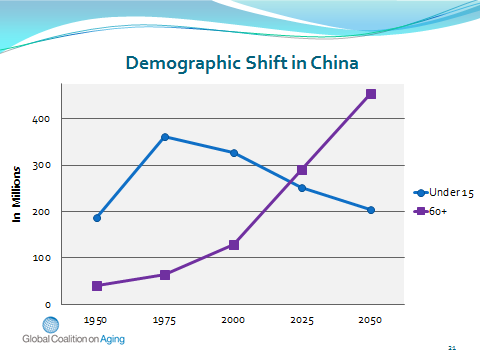 China should rush to increase its retirement age or even get rid of it. Why not encourage people to work as long as they can, which would be more relevant to 21st century demographics? After all, the age 65 was initially chosen by Bismarck in the 1880s and brushed off by FDR and Bevin in the middle of the 20th century. How is it at all relevant today? 2: Invest in health as an economic growth driver. At the center of any economic growth strategy must be a healthy population that is working, creating enterprise and spending. In earlier centuries, we didn’t have to think much about that because the majority of people were young and healthy. When it did enter our collective thinking, it was about such broad public health policies as childhood immunizations, which had the effect of protecting our future; or of targeting communicable diseases, so that whole swaths of populations were not destroyed. This has profoundly changed: The percentage of those of us over 60 – people who used to be considered old and implicitly not very relevant to economic growth – are in the process of becoming substantial proportions of overall populations. China will need to reimagine the role that health spending has in its policy mix, where they’ll need to target such huge burdens as Alzheimer’s and the equally critical aging conditions as skin, muscle mass and vision deterioration. A wellness program around these issues would result in more Chinese over age 60 working, creating goods and services, and spending. From technology to pharmaceuticals, urban infrastructure to communications, social care needs to financial services, and education to labor, the Chinese will want to ensure their older citizens are the beneficiaries of the best of global enterprise. An innovation culture would inform a life course of healthy aging. Consider, for example, the changes taking place in home care, where caregiving can be a driver of productivity as much as a social good. And how the private sector, business, and markets can provide care and tools for prevention. Whether China’s aging population becomes promise or peril, as the World Economic Forum put it in its book on global population aging, will be determined by how China begins today to transform its public policy and institutions. The IMF, World Bank, WHO, APEC, G-20 or OECD projections all assume 20th century behavior in which those over age 60 are drains on economic growth. But if China behaves as a 21st century power, its aging populations will be a source of economic growth and become part of what keeps that engine going.